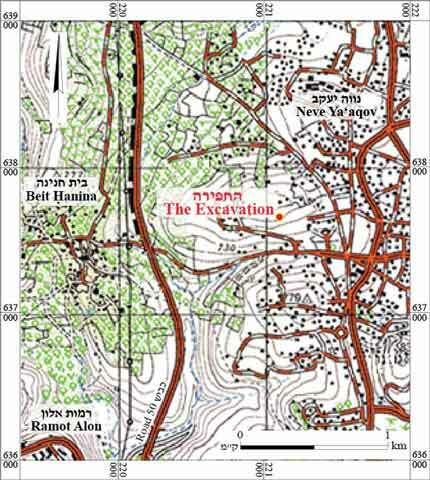 In November 2014, a salvage excavation was conducted in the Beit Hanina neighborhood of Jerusalem (Permit No. A-7242; map ref. 221005–131/637620–653; Fig. 1), prior to paving Highway 301. 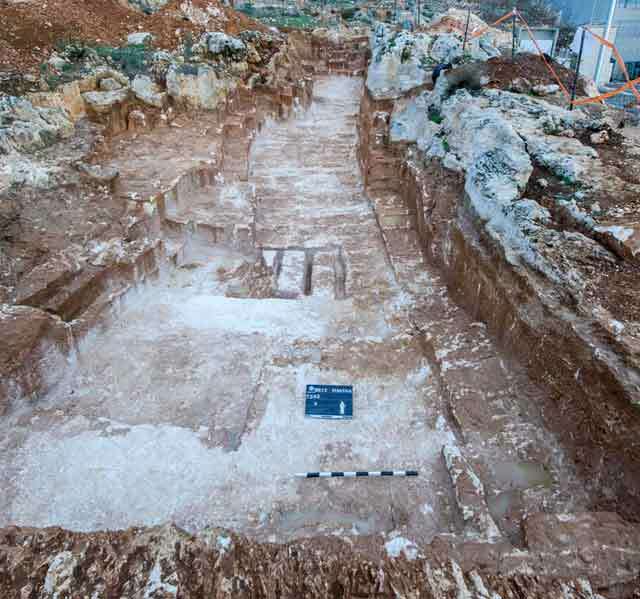 The excavation, undertaken on behalf of the Israel Antiquities Authority and financed by the Moriah–Jerusalem Development Company, Ltd., was directed by Y. Billig, with the assistance of N. Nehama (administration), A. Peretz (field photography), V. Essman and Y. Shmidov (surveying and drafting), D. Tanami (metal detection), the Sky View Company (aerial photography) and D. Porotzki (plans). Three ancient quarries (A–C; Fig. 2) in soft limestone (malaki) bedrock were exposed. Quarries A and B were adjacent (Fig. 3), whereas Quarry C was located c. 70 m to the west. The quarries were documented in a survey that was carried out in the past, prior to paving Highway 301 (Weigmann 2013: Sites 4, 6, 7). 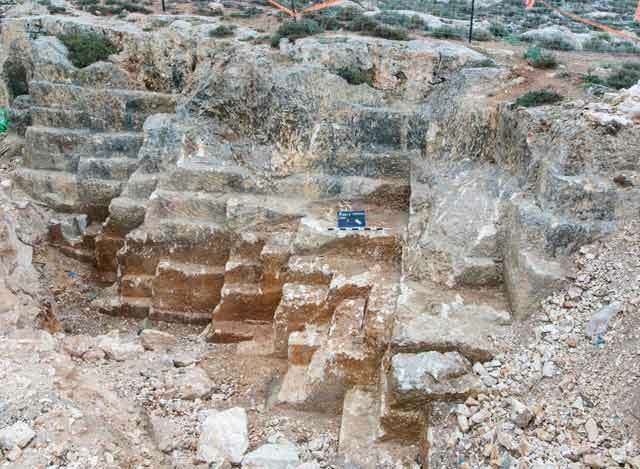 Numerous quarries dating to the Roman and Byzantine periods were discovered in surveys and excavations previously carried out in the area (Mizrachi 2008a; Mizrachi 2008b; Zilberbod 2012a; Zilberbod 2012b; Zilberbod 2013; ‘Adawi 2014; Yeger 2014a; Yeger 2014b; Yeger 2015; Yeger 2016; Permit No. A-6324). 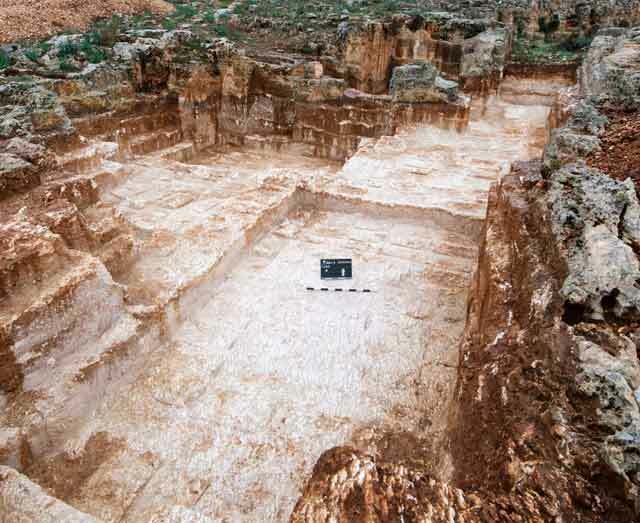 Quarry A (c. 150 sq m; 3.0–8.0 × 24.4 m, depth 1.0–2.5 m; Figs. 4–7). 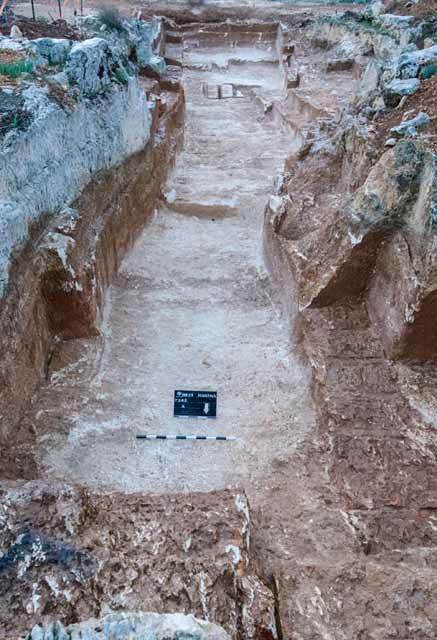 The quarry, which became deeper towards the north, was completely unearthed, revealing six quarrying steps, where medium-sized stones were produced (0.30–0.35 × 0.35–0.45 × 0.65–0.75 m). A row of large stones (L103; 0.40 × 1.44 m) that had not been detached from the bedrock was uncovered on the floor of the southern part of the quarry. Channels demarcating individual stones and evidence that stones were detached from the bedrock were discerned on the quarry’s floor as well. A mark in the shape of an inverted U (L102; Figs. 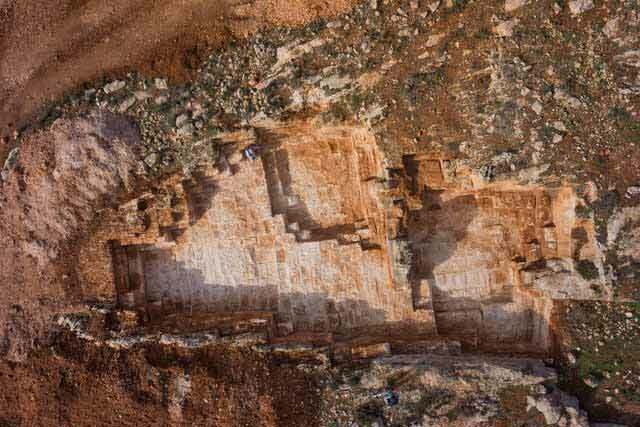 8, 9) was carved on one of the vertical surfaces near the northwestern corner of the quarry; its significance is unclear. 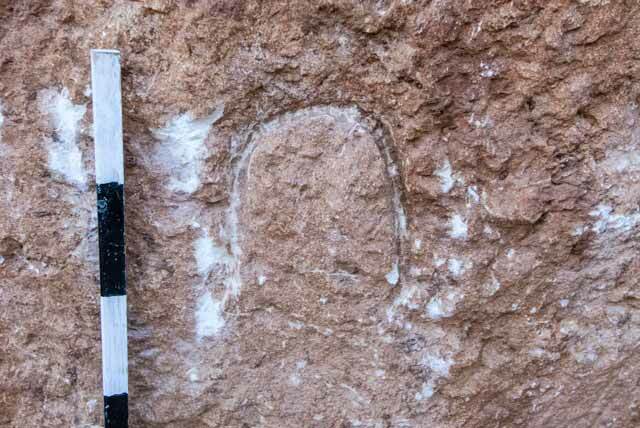 On a bedrock surface at the foot of the carving was a small concentration of pottery sherds that dates from the Late Roman and Byzantine periods. At the bottom of the quarry was an accumulation of crushed rock-cutting debris that stuck to the bedrock due to limestone sediment. This layer contained several iron slivers that had apparently chipped off the tools used by the quarrymen to cut the stone. 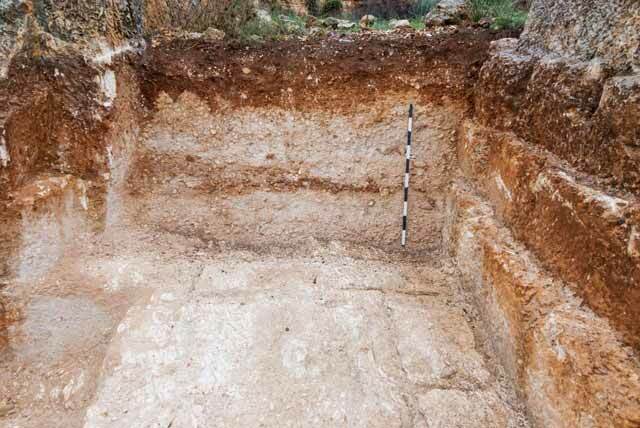 This layer was covered by an accumulation of brown earth mixed with crushed stones. Evidence of modern rock-cutting was discovered in three locations in the quarry: drilled vertical holes for inserting explosives. Another smaller quarry was located slightly north of Quarry A. Quarry B (c. 133 sq m; 7–10 × 19 m, depth 1.50–3.65 m; Figs. 10–13). The quarry was only partially exposed; it continued another 15 m to the north, where it became deeper. Six steps, where medium-sized stones (0.30–0.35 × 0.35–0.50 × 0.65–0.80 m; Fig. 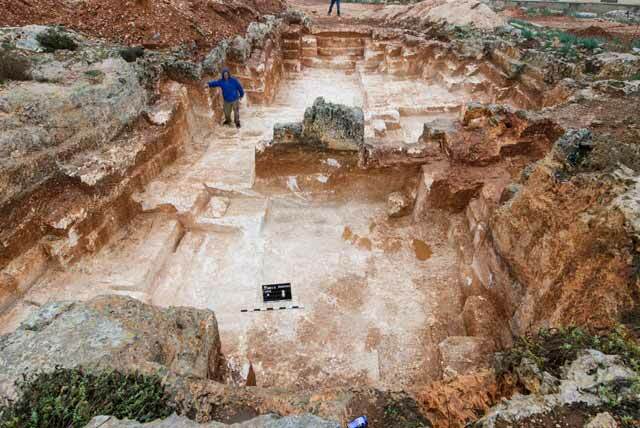 14) were hewn, were discovered in the quarry. 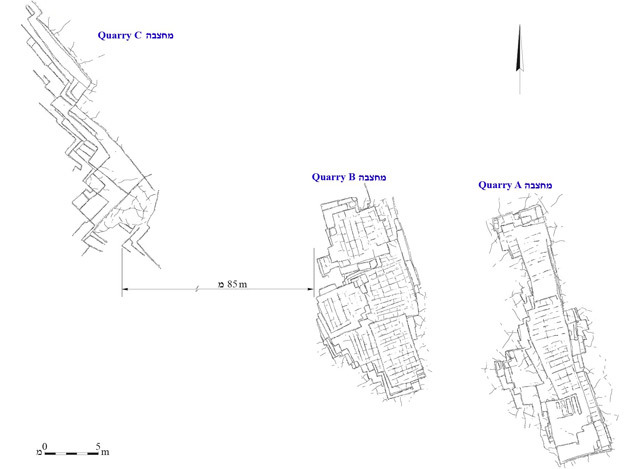 Square courtyard-like quarrying units (L202, L203) were revealed in the western and northern parts of the quarry. 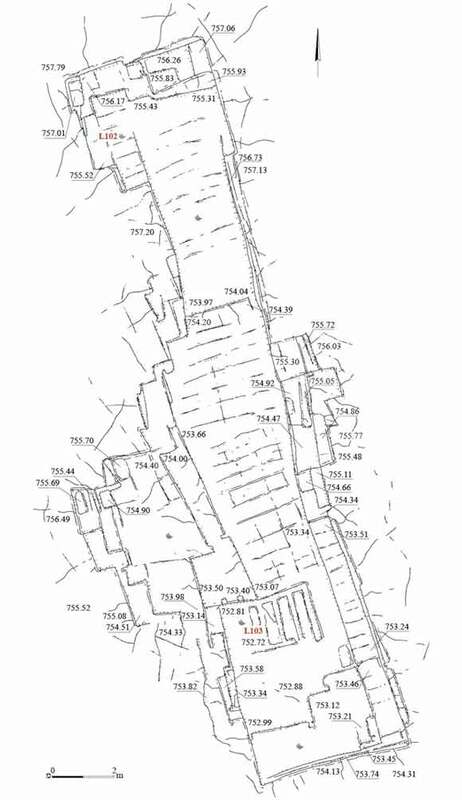 On the floor were quarrying channels that separated stones and severance marks that indicate that stones were detached from the bedrock. On the bottom of the quarry was a layer of rock-cutting debris consisting of white crushed stones (average thickness 1.5 m; Fig. 15) that stuck to the bedrock due to limestone sediment. An iron sliver that had apparently chipped off one of the tools used in the rock-cutting was found in this layer. Dark earth, stones and modern refuse accumulated above the layer of quarrying debris. Quarry C (24 sq m; 2–4 × 14 m; Figs. 16, 17). 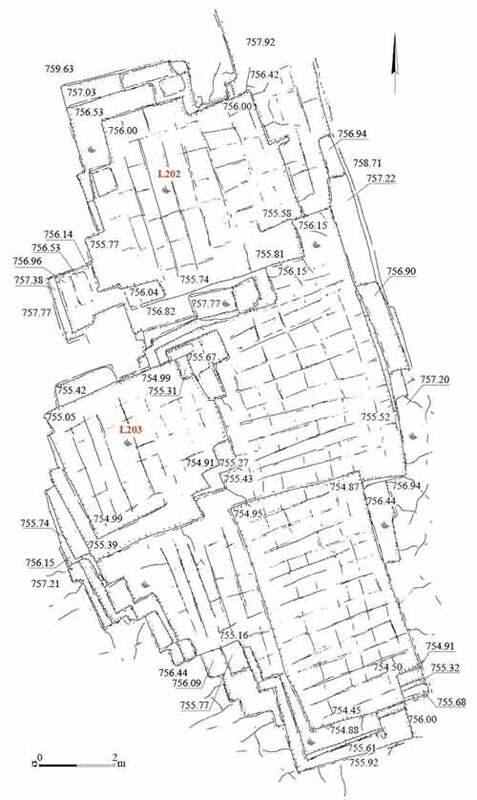 This quarry was the southeastern end of a large quarry that was excavated in 2012 (Area K; Zilberbod 2012a: Figs. 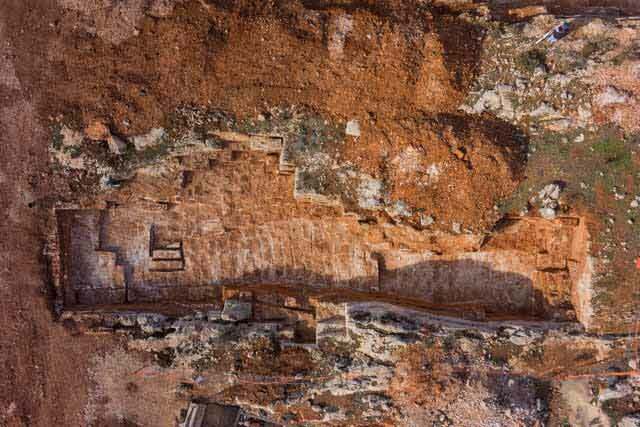 1, 2), when twelve steep quarrying steps (height of each step 0.4–0.5 m, overall height c. 5.3 m) were discovered. Most of the area inside the quarry was covered with modern refuse. 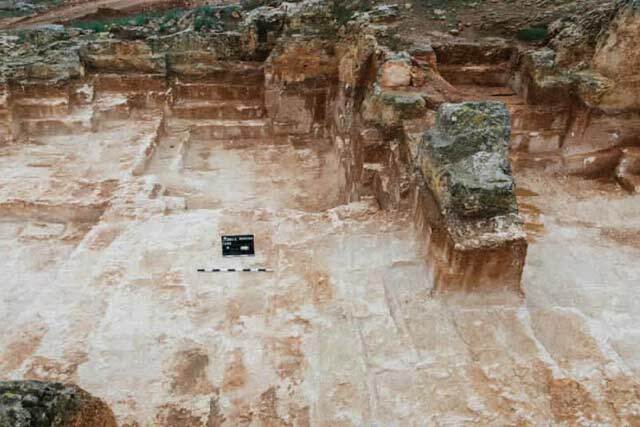 The continuation of the quarry south of the excavation area was identified at the base of a garbage heap. Two locations of modern rock-cuttings were discerned in the upper part of the quarry, where holes for explosives were drilled. 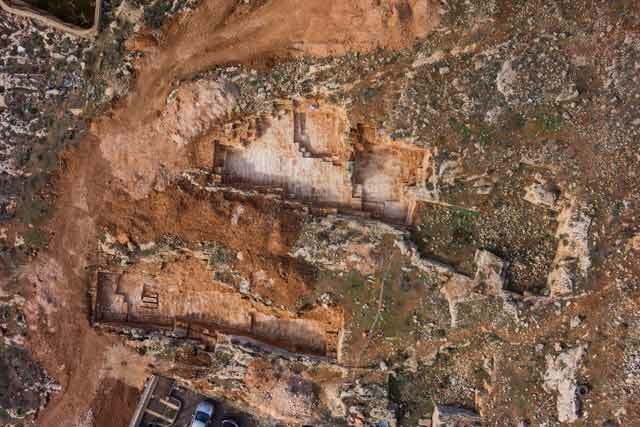 The quarries discovered in the current excavation augment the dozens of quarries of various sizes previously unearthed in the north of Jerusalem, north of Nahal Zofim and west to the watershed. 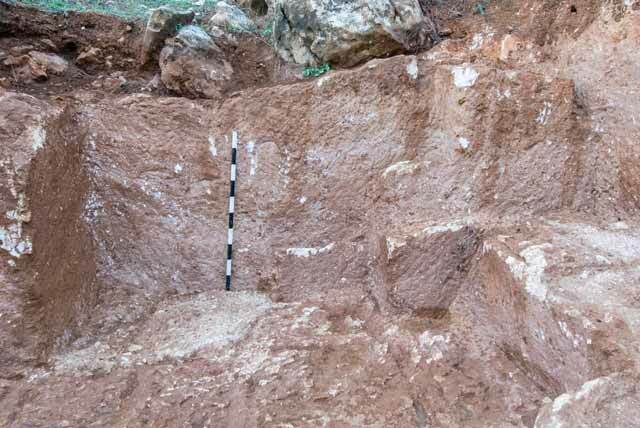 The scant pottery discovered in Area A—dating the unearthed quarries to the Late Roman and Byzantine periods—are similar in date to the finds from other quarries unearthed in the area. 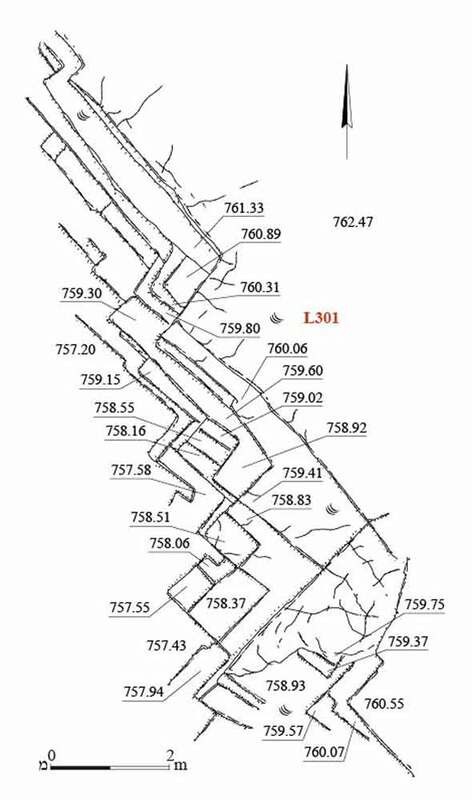 The location of Quarries A and B, adjacent and parallel to each other, seems to suggest that the land was owned by two neighbors who leased it to quarrying contractors. After the quarries were no longer in use, they were apparently filled with quarrying debris and soil, and the area, which was formerly rocky, was converted to fertile farmland. Adawi Z. 2014. Jerusalem, Shikune Nusseiba. HA-ESI 126. Mizrachi Y. 2008a. Jerusalem, Shikune Nusseiba (A). HA-ESI 120. Mizrachi Y. 2008b. Jerusalem, Shikune Nusseiba (B). HA-ESI 120. Weigmann A. 2013. Jerusalem, Beit Hanina, Survey. HA-ESI 125. Yeger D. 2014a. Jerusale, Beit Hanina. HA-ESI 126. Yeger D. 2014b. Jerusalem, Shikune Nusseiba. HA-ESI 126. Yeger D. 2015. Jerusalem, Shikune Nusseiba. HA-ESI 127. Yeger D. 2016. Jerusalem, Shikune Nusseiba. HA-ESI 128. Zilberbod I. 2012a. Jerusalem, Beit Hanina (A). HA-ESI 124. Zilberbod I. 2012b. Jerusalem, Beit Hanina (B). HA-ESI 124. Zilberbod I. 2013. Jerusalem, Beit Hanina, Shikune Nusseiba. HA-ESI 125. 3. Quarries A and B, view from above. 5. Quarry A, view from above. 6. Quarry A, looking north. 7. Quarry A, looking south. 8. A carving in the side of Quarry A, looking west. 9. A carving in the side of Quarry A, looking west. 11. Quarry B, view from above. 12. Quarry B, looking north. 13. Quarry B, looking south. 14. Evidence of rock-cuttings in Quarry B, looking west. 15. Quarrying debris in Quarry B, looking north. 17. Quarry C, looking north.